I am a happy and proud Mom of two. I am absolutely in love with motherhood. Whenever I find out that one of my friends are pregnant for the first time I immediately get this feeling of excitement for them. I don’t know any stronger feeling than the love you have for your own children. In my last post I very briefly told my story about how I got to where I am now, but I totally skipped right past a very important part of my life with the sentence “Fast forward ten years and two babies.” It’s so funny, I have been wanting to write about motherhood and how it can sometime take ahold of a woman entirely whether they planned it that way or it just happens. It can happen so quickly you don’t even realize it until you write the sentence, fast forward ten years and two babies and your like holy crap, how did that just happen! Literal mommy coma! Wake up, morning routine, feed kids, clean up after kids, feed kids, entertain kids, clean up a spill, feed kids, bedtime routine, sleep, repeat. Then they are school age and you add drop kids off at school, pick up kids, to the mix. I remember the day I found out I was pregnant with Vivien, now 7.9 years old, it was very unexpected. I was finishing up school for interior design, dabbling in acting, and I loved to write. As the months went on and I got more and more pregnant and more and more tired, I slowly started to veer from my intentions and career goals. It was June of 2010 when my sweet Vivien was born. I spent the whole summer being a new mom. It was my full time job. As a lot of moms know, those first several months can be rough and consume you entirely. Since Viv was my first, I wanted to be there every second for her. I didn’t want to miss a thing. As Viv hit the one year mark, life got a lot easier, I slowly started taking on interior design clients. It was tough juggling work and motherhood especially when the hubs worked full time and for the simple fact that childcare in NYC costs nearly the same as one of us made working all week! Well, as Viv hit 15 months we had another surprise hit us! Baby no. 2! We weren’t ready for another baby at that very moment! I remember getting hit with a minor case of anxiety! A few months into a stressful second pregnancy, I nearly gave up hope of really succeeding as a designer, I had totally thrown out the idea of acting and was writing less and less. I became a full time mom, and it was fine because I didn’t “have” to work. Fast forward a couple years, there I go again, fast forwarding precious years! Well, something finally clicked! I needed more. I love my children more than life itself, but I wanted to do more. I had all these great ideas before I became a stay at home mom and I pretty much forgot all about them as I fell into the easy life that was motherhood. Now don’t get me wrong, being a stay at home mom is hard work, it can be very satisfying and for a lot of woman is the greatest job in the world. But for me, I lost myself in motherhood. But I was determined to find myself and remember who I was before children and what I wanted out of life. I started taking on clients again, I put myself around other artistic minds, I felt full of life again. I noticed that my want to succeed in life was even stronger because I wasn’t doing it for myself anymore, I was doing it for my family. I think it is so important to remember who you were before motherhood. And take all that power that comes with being a mother and put it into everything you do. How many moms out there have forgotten their name? Not literally of course. But do you remember who you were before motherhood? Are you pursuing all those dreams you had before you had children? Motherhood is such a blessing no doubt, but even moms deserve to chase their dreams. A little Monday motivations for you, my story (in a nutshell). I get asked all the time: how did you guys start working together? I just love the story of how I ended up in Nashville working with sis. It’s a fun one, here goes! I moved to NYC from Las Vegas when I was 21 years old to pursue my dream of becoming a world renowned House music DJ. Wikki wikki! Well, that was short lived. One night while visiting a neighbor my Brooklyn apartment got broken into and my turntables and mixer stolen! They even took my piggy bank, no joke! Well I decided not to purchase new DJ equipment, and instead pursue interior design. The mom in me thanks the younger me for that decision. Lord knows late nights DJing and children don’t mix well! I attended New York School of Interior Design where the instructors inspired me beyond my wildest dreams. They were all so good and successful at what they taught. I wanted to be good, really good, and successful at my job. Random memory, but pivitol none the less: I remember my Color teacher sitting at her desk so casually cool with her feet propped up on the table in front of her, legs crossed at the ankle, and I noticed her loafers had the red PRADA strip at the heel. Everyday, her shoes were just so perfect! I knew I had to work hard so I could successful enough to casually wear PRADA shoes everyday, not quite there yet, but working on it! Living and learning in New York puts you in this mind set that you can do anything, aka the New York State of Mind. Well I set my mind to a bunch of things. My husband thought I was losing it! I would come home with a new idea on the regular! In addition to my design classes, I took acting classes, I started writing, and I got my real estate license. I always wanted more! Fast forward ten years and two babies. I visited Alana in Nashville where she was working in new construction. Nashville is one of the fastest growing cities in our country and I could tell she needed my design expertise. After living apart for my twinny twin twin for a decade, my family decided to make the move. Since I was leaving NYC, the city of dreams, I had to make our move worth it! This is where all my bright ideas shone through. Remember those acting classes? All that writing? My real estate license? Yea, I put it all to good use. I wrote up a show pitch feauring my sister as THE REALTOR and me THE DESIGNER and BAM, Listed Sisters were born! 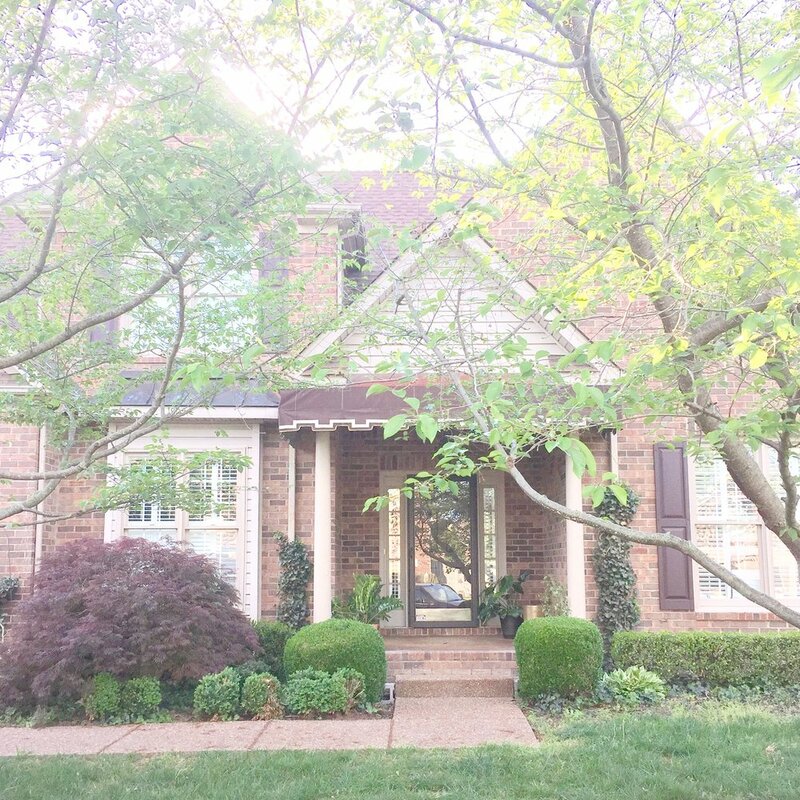 Alana and I have bought, sold, renovated, and or flipped over 50 homes for our clients in the past two years here in Nashville. I’d say we are pretty good at our job! And LOVE what we do! Moral of the story, no dream is too big, you can have it all with hard work, persistence and focus! Never stop learning. I can’t stress the importance of continued education in anything you do. To be successful you have to stay current. Hope this week rocks! Happy Monday! If you have any questions or just want to say hi, shoot us an email (email on contact tab) or leave a comment below! Would love to know what motivates you! I love love love the way our dining room turned out! I wanted to jazz this room up but didn’t want to make any major structural changes. We were able to add a ton of interest by adding a panel detail to the walls. Going for drama we painted the walls and crown molding this gorgeous black by Sherwin Williams called Bohemian Black. It has just the slightest hint of purple in it. Gorg!! This is the first room you see on the left upon entering our home so it had to make a statement and what better way than with the lighting? We swapped out the old dated light fixture for this awesome Sputnik chandelier from Pottery Barn! I especially love this find because it is so similar to the much more expensive Arteriors version. I wanted to be able to use this “formal dining room” all the time so I went with this casual but cool reclaimed wood dining table, seagrass chairs and matching bench that is perfect for the kiddos! The wall art really helped the whole room come together. We went with a black and white theme with touches of gold and lots of wood to warm it all up. How about these conversation plates? They have fun cartoons from the New Yorker. I found these years ago at Restoration Hardware and just knew I would find a place to use them one day! Shoot me a message with any questions or comments! You can leave a comment below or email me! Contact info is in the contact tab! Until next time. I am super excited to share details of my gallery wall with y’all because it is one of my fave parts of our home. I know gallery walls aren’t for everyone, they can be such a headache to create! It really is a kind of art in its self to put together a bunch of art and stuff on a wall and make it all work. This wall took us about 3 hours to put together and that was after we already had decided on most everything we wanted to hang. We spent the 3 hours deciding what order to hang it all. First thing I can recommend to make it a bit easier and save your wall from too many unnecessary holes is to lay it all out on the floor and come up with a satisfying order before you pick up that hammer! I like picking one pretty centralized piece and working around it. Of course there is a plant (or two) somewhere near! I wanted our wall to be a bit whimsical and playful so we have several unexpected items in our gallery. It’s also fun to add texture. Everything doesn’t have to be flat! I’m a huge fan of hanging abstract things on walls to bring depth and interest to a space. Once you have settled on the order you want it all hung you can get started! I have added a few things here and there since our initial install day and I am pretty happy with where we are at now. Viv was a flower girl in our friends wedding back in August and wore this head piece. It was so pretty we decided to add it to the wall! Randomly fun addition! Old books make everything better! We made this little book shelf with tobacco sticks we found at the Nashville Flea Market. We got these old snow shoes from my in laws house. Totally unexpected but totally fit with the overall color scheme and earthy feel of the gallery! Thanks for reading! Comment or shoot me an email with and questions or just to say hi! I am so happy that my kitchen remodel is complete! And to think my hubs pretty much installed this whole kitchen himself which saved us a pretty penny not having to hire installers for every little thing. We had Habitat for Humanity come in and deconstruct our old kitchen and take everything out of here. I love donating things from remodels whenever I can. If you are thinking about a kitchen remodel and your cabinets are in good condition, please consider donating before demo’ing everything. Check with your local Habitat for Humanity to see if they offer this service. Once we had our clean slate it was pretty much smooth sailing from there. I ordered the cabinets online from CliqStudios. I went with the Austin inset cabinets in their Carbon finish. This is a great option for purchasing cabinets if you have an installer or can install them yourself. I opted for drawers in my lower cabinets whereever I could because they are so much easier to keep organized than door base cabinets. The drawers make for easy accessibility to pots, pans, cutting boards, etc. Pulls and knobs are from Rejuvenation. Cambria Quartz countertop. Design: Rosedale 2” mitered edge; waterfall edge. Open reclaimed wood shelves from Goodwood Nashville. Wood plank backsplash that has been stained (Minwax Early American) and sealed. Faucet, Delta. It's done and I am in love! I can finally share the details of my master bathroom, and there are a lot of details to share! I wanted to stick with classic materials so I went with marble and quartz. Two inch marble hex for the floors and plumbing wall detail and 4x16 inch marble tile for the walls. Both walls that the shower share were tiled floor to almost ceiling and we added an extra bit of interest with the marble baseboards. The whole house has shiny brass light and plumbing fixtures when we moved in. I came back with satin and aged brass fixtures throughout for a more modern flair. I love adding some type of treatment to any wall I can so we put up wood planks on the walls that didn't get tiled, and painted them Reserved White from Sherwin Williams. The countertop is quartz from Cambria. It is one of their newer designs, Clareanne, and is absolutely beautiful. I love the way it compliments the marble, black cabinets and gold plumbing fixtures. We had the edge mitered to give it a thicker profile. So glad we did that, I love the white veining detail that flows through the front edge of the countertop. Perfection! And there you have it! Up next, kitchen details! If you want a space in your home redesigned shoot me a message! I would love to help. Come join us this Thursday, Oct. 26th, for our LAVA Pop Up Sip and Shop from 6pm-9pm! We are located inside Native + Nomad on the first level at the Coolsprings Galleria. Wine and cheese, home decor and clothing. Plus a free gift with purchase! 'nuff said! A coffee table is one of my favorite things to style. There are a few simple things you can keep in mind to give your living room table that polished designed look. go for "The Power of Three"
Where to Find us in October!! Alana and I will be all over this month! I'm talking East Coast to the West Coast! If you are near a city we will be in please come say hi! We love meeting people that are following us on our journey. And hey, you might even learn something! We will be giving our 'No Demo Reno' presentation where we give ideas on how to transform your space with out the mess of demo'ing anything! We also have a fun presentation where we talk about how to get the designer look with my "Room Recipes". Every room has a recipe and if you follow it, with your own ingredients of course, you can achieve that polished designer look! Come see us in Eugene, Oregon on Oct. 7th and 8th. We will be on stage twice daily at the 35th Lane County Home Improvement Show. East coasters, we will be in NY at the Realty 411 event on October 14th talking real estate and best ways to invest in your property whether buying selling or flipping! We will be in Daytona, Florida on the 15th giving our No Demo Reno presentation. Hope to see you out at one of these events!! 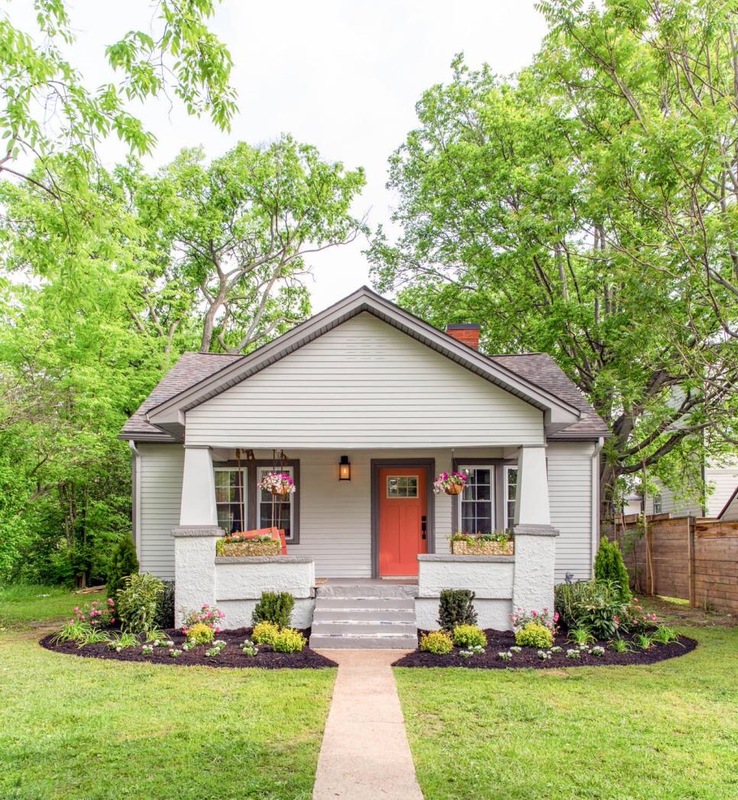 I love the way this little East Nashville home turned out. 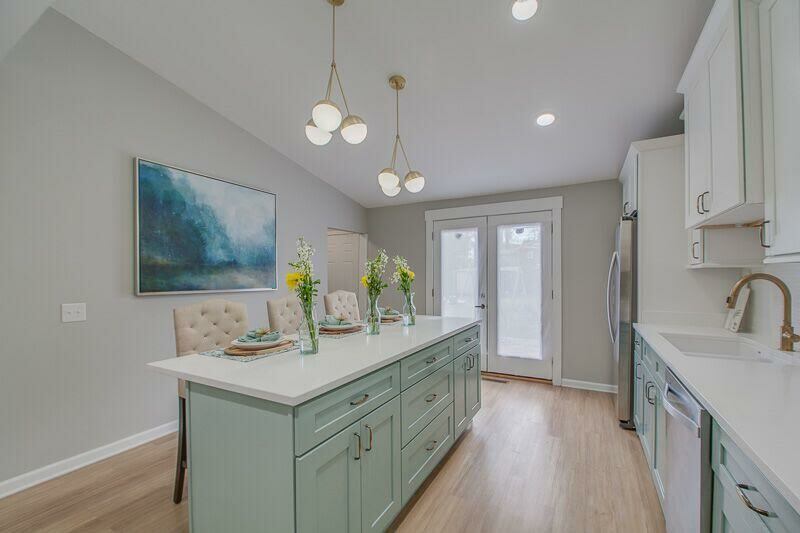 We went with a bright white kitchen and mixed it up with blue island cabinets! For a bit of extra interest we added a leg detail on the sink cabinets. Alana and I made this super easy and chalkboard with chalkboard paint and some pallet wood I had laying around in my garage. $9.00, done! Now it is the perfect place to leave a playful message. This nursery is so very sweet. Walls painted SW9133 Jasper Stone. Rug, Jaipur (available to order through LAVA.) Crib and chair from Target. And I'll leave you with some shots of the living room! It was so floral and fun! Please feel free to shoot me a message with any questions from this reveal or if you want help with any updates in your own home! Enjoy the rest of your day. There are so many ways you can boost your home's curb appeal. And a lot of them won't break the bank! 2. Spruce up your landscaping or add planters! This can make your home feel extra inviting. And the great thing is, there are plants and flowers for every season so you can have beautiful planters all year round. 3. Update, paint or add shutters around windows. You can paint your existing shutters or make some! Board and batten shutters (the blue ones below) are super simple and inexpensive to make. Your home's exterior is its first impression, make it lasting! 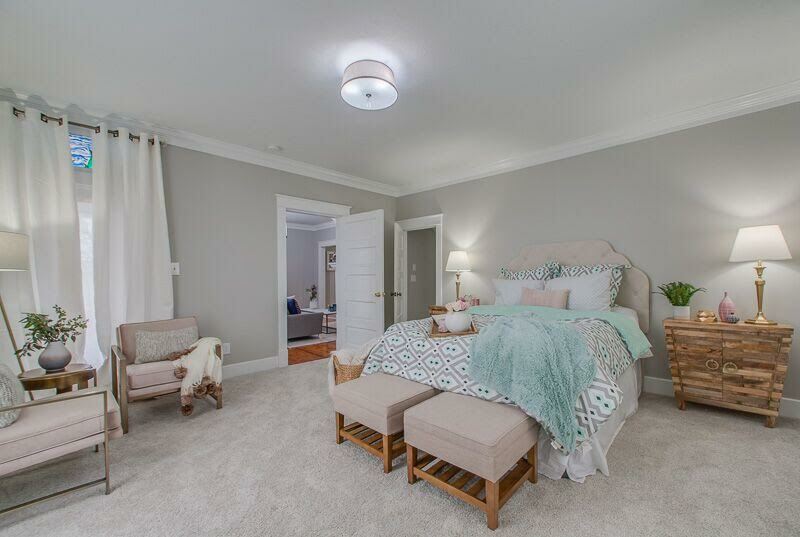 We had so much fun re-designing this house for Jordan. We transformed your typical ranch-style home into a modern industrial bachelor pad! My two favorite parts of this project involved concrete. 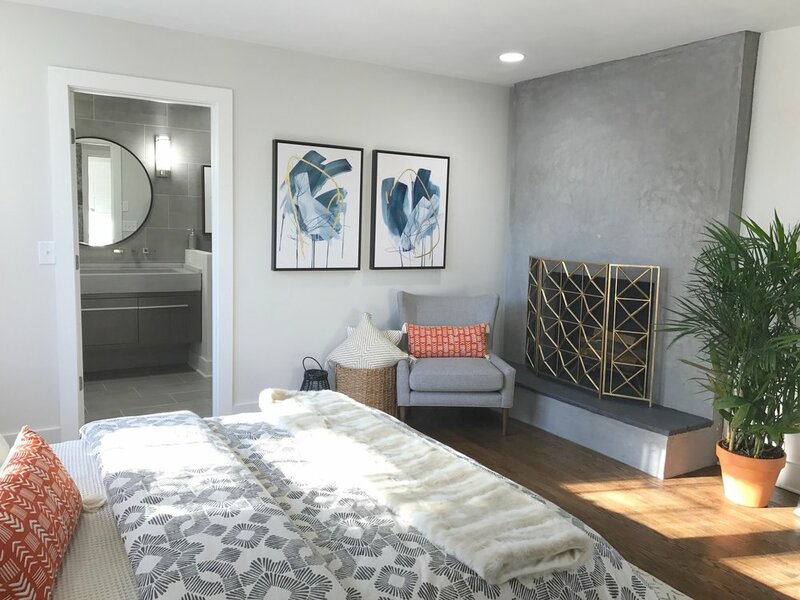 I am pretty much obsessed with the way the fireplace turned out and the custom concrete sink made by the talented Abstrak looks absolutely amazing. Our contractor on this job, Reggie Polk from Polk and Associates, was a complete joy to work with. Now let's get down to the details! I'm going to start with my fave feature, the fireplace! Y'all. Look at the before pic! We come across a lot of brick fireplaces some of them are in great condition and don't need any work, but some just need to be refreshed! We love to paint fireplaces or white wash them. In this case we went with a cement application. This is how the room looked the first day we came in to start the project. Old-school wood paneling and a slightly dated fireplace. So happy with the way the fireplace turned out. This brick wall was the original exterior of the house. We love a nice exposed brick wall but wanted to make this one special! Alana and I whitewashed the brick and I designed this cool mural to really personalize the home. The homeowner, is a Tennessee boy so we had to represent with the tri-star. Overall I am super happy with the way this room turned out! Now let's talk about that bathroom! I don't know where to start. The custom concrete sink was made for us by Santana whose company Abstrakt Concrete can make all your concrete dreams come true! And that fab mirror, would you believe me if I told you it was only $160 from Urban Outfitters!? We finished off this awesome bathroom with modern sconces and wall mounted faucets. Bummed I didn't take many pictures of the kitchen! I love the contrast of the wood cabinets and the gray quartz countertops. Here are a couple progress shots and detail shots. This tile mat is perfect in front of the sink! I love hardwoods in a kitchen but the water always makes me nervous. With the tile detail in front of the sink there is no need to worry about water splashes while doing the dishes! Last but not least, the exterior! Check out this before! Don't get me wrong, I love a nice brick home, but we wanted to make this home a stand out! We painted the exterior brick Peppercorn SW7674 and the trim was painted Tricorn Black SW6258. Front door painted Marigold SW6664 (the perfect Tennessee orange!) Custom cedar chevron shutters made by my amazing hubs, and we built out a gable over the front porch that was clad in cedar shake and held up with cedar posts. Landscaping done by XM Scapes, they are the best! And a little behind the scenes on reveal day! All smiles and cameras everywhere. We will see you again next week! Did you catch this week's episode of Listed Sisters? The Browns are the sweetest couple ever! Alana and I are so happy we were able to help them turn the tragedy of fire around. This home was devastated by a fire shortly after the Browns moved in. We convinced them to stay and let us renovate it so we had to make sure all memory of the fire was washed away. We went with light and airy design choices throughout. In the kitchen we brought in clean bright white cabinets, beautiful light grey quartz countertops and an awesome rustic reclaimed wood hood. The handcrafted subway tile backsplash in soft blue was the perfect way to add that touch of color this home needed. It's the details that count when designing a space. The white shiplap on the back of the island adds a layer of interest. We were dealing with a small home so we went with 12" deep base cabinets and floating shelves to save on space but still deliver storage and functionality. The awesome vintage door we used for the pantry came from Preservation Station. It was such an amazing find. If you look really closely on the right side the you will find 1 Corinthians 13:4-8 written on it! Of course we had to preserve that so we painted the crackling paint and the beautiful bible verse with Peel Stop, a sealant that keeps crackling paint from chipping off! When you are on a tight budget but want to make a room feel special you have to get creative. That is exactly what Alana and I did to give the Browns an extra rustic, super cool, inexpensive live wall! All it took was a pallet and a plastic gutter! The pallet was free the gutter cost next to nothing, et voila! This home was charming and rustic and the Browns loved plants, so this little project was perfect! Door, shutters, and columns all stained Minwax Provincial. We will be back next week! Wednesday 10p/11c on HGTV. I love the way last night's renovation turned out and Kurt and Emma "Kemma" were a blast to work with. We ended up with a vintage boho styled interior and I think it fit Kemma's design personality perfectly! I get a lot of questions about paint colors, decor, diy projects and even my outfits following every episode so I have decided to break each episode down for y'all the day after they air. First things first paint! If you know Alana and myself then you know paint is key when it comes to transforming a space. Luna loves her new front porch! Interior. All the light walls are Reserved White SW7056 and the gorgeous green in the dining room and bathroom is Hunt Club SW6468. I love bringing in color to dining rooms and bathrooms. This green is stunning and added a ton of personality to the home. How about the easy DIY headboard Alana and I whipped up in a pinch? We were on a crazy tight budget so this headboard was an awesome and affordable way to anchor the bed in this boho bedroom. We used 1x10 pine planks and trimmed them out with a 2x4. The stain is one coat of Provincial by Minwax. Last but not least, our reveal outfits. I got several messages asking about the dress I wore. I love this dress and have been living in it this summer. It's Blu Pepper. I got it at Bliss in Knoxville. If you are ever in Knoxville you have to stop in! Alana's super cute knit top is from Molly Green. Thank you all so much for watching we will be back next Wednesday at 11/10 PM C on HGTV! I rarely come across a kitchen renovation that doesn't need one or more new appliances. My home's kitchen remodel is no exception. A new appliances package alone can sometimes make a dated kitchen feel updated instantly. I'm sure you have heard the phrase "The kitchen is the heart of the home". If that's the case, our new home needs some serious cardio work! It is currently yellow and white and we just removed the floral wall paper boarder. While it is clean as a whistle, it all has to go! I called up Habitat for Humanity, and they are coming to take this well kept kitchen to a new home. Deciding on an appliance package was fun! One thing we knew for sure was that we wanted to go with black stainless appliances. That did help narrow our search down some. Counter depth vs Standard refrigerator. I am a stickler for counter depth fridges. Bottom line, they really help streamline a kitchen. it didn't take long hours for me to settle on our fridge. We were browsing options when I opened the KitchenAid French Door Counter Depth fridge and immediately fell in love! I imagine this thing filled with tons of pretty sparkling water and perfect party trays of fruit and cheese and finger sandwiches, then I remember I have two little ones and live a real life and I know it will be filled with milk, pickles, broccoli and left over spaghetti, but I am still happy! I mean look at this thing! After the fridge was decided on, it was a piece of cake to finish our appliance package. Slide In vs. Freestanding range. A freestanding range has the knobs on a panel on the back of the range, and a slide in range has the knobs on the front which provides a sleeker look. I am super excited to go from an electric range for the past 4 years, back to a gas range! I LOVE the look of our new KitchenAid range! Moving on to the dishwasher; Sticking with KitchenAid they offer a peek through window option. It was tempting, but I figured I don’t need to watch my dishes get washed, so we went with the straight forward option that has the awesome modern handle to matches the rest of the appliances. Last but not least, while I wish I was someone who didn’t have a use for a microwave, I am not. KitchenAid offers a great convection option that does everything an oven can do, but we decided to save a few bucks and go with the straight forward microwave that completed the package. It's going to be in our dry bar area and we plan on building a custom wood hood for above the range. The black stainless is so mod and chic I can't wait to see it all come together. Now to get my kitchen deconstructed and put back together! Feel free to leave any comments and questions about these or any appliances below. *All opinions expressed in this post are completely mine. This is not a sponsored post. Every room has a recipe when it comes to design. Alana and I speak at a lot of home shows where I break down rooms into recipes and I have had a lot of positive feed back from attendees. On that note, I have decided to go room to room and share my recipes with y'all. Starting with the Master Bedroom Recipe. This list can help you create a bedroom that will have you dreaming about bedtime all day long. An upholstered headboard can help soften a bedroom and make your bed oh so inviting. Night Stands aka Side Tables. If you want to be safe, matching side tables are and beautiful way to anchor your bedside. Table lamps and bedside accents. Here is a link to a detail blog entry about styling that bedside! Beautiful Bedding is a must. I always say if you splurge anywhere, bedding should be the place. You retire to your bed and wake up in your bed most days. I LOVE the look of an all white bed. It is just dreamy. If you are going all white be sure to introduce texture. Having fun with bedding is a great way to introduce color into a bedroom. Don't stop at bedding! You need throw pillows and throws to complete the look. Accent pillows that match or contrast with the bedding are a nice extra layer of design and the throw is the cherry on top. Throws are another great opportunity to add either color or texture, or both! Lighting! If your room has the ceiling height, put up a gorgeous chandelier! Updating lighting can be a way to give new life to a room without any renovations at all. Wall decor: Art or mirrors are great above a bed or above your night stands. The possibilities for this are endless. My old master had mirrors above my night stands, and an awesome reclaimed wood piece we made from some old barn wood above our bed. Not sure what we will be going back with since one bedside has a window next to it and the other doesn't! If you have the room for a bench or a couple upholstered stools at the end of a bed, go for it! Finish the space off with a plant (or two or three) They really help make a room feel fresh. I am super excited to be getting my new master bedroom together! I just ordered this light fixture! Just have to patiently await its arrival, paint and done! Can't wait to share pics! The bedroom is the perfect place to find your design personality! Make it yours. I am so excited to announce that we have purchased a new home! My sweet sis, Alana, helped us close on the perfect little house that we will be starting a pretty substantial renovation on in the coming weeks! Eeek! One new kitchen, three and a half new baths, living room overhaul, master bedroom re-design, and two sweet kids room coming up! I have renovated homes for so many families in the past several years I am excited to finally be renovating and settling down in our own happy home! I will be posting progress and project details along with tips on how to get the designer look in your own home! I am excited to share this journey with you all and hope to give some helpful advice along the way! I will say, so far this has already been a lot different than designing for a client. I have heard from many designers that designing for themselves is more difficult that it is designing for a client. I have fallen in love with so many of my different styles it has been hard to settle on a style for my personal home! But after 2 months of thinking and debating and changing my mind, I have decided on a design theme! Will it be bright white and airy, or dark dramatic and moody? Stay tuned!! Alister was either so excited about our new home, he accidentally put on two different shoes, or he is trying to start a new trend. Hmmm.. Considering my love of plants, this sunroom will most likely end up being my favorite room in the house. Can't wait to renovate this space! I have always been more of an indoor plant kinda lady but this house comes with a killer garden filled with a variety of beautiful plants! We have wisteria and we even have our very own fig tree! Neutral doesn't have to mean gray, beige or white. If you want to add interest to a room but you don't want to go with a bold bright color, try a colored neutral. I love using blues and greens that are super subtle and pretty much pass as a neutral because they are so easy on the eyes. Here are some of my go to colored neutrals. I think they work perfectly in a bathroom, master bedroom, or any room you want to feel peaceful and serene in. Do you lean more towards neutral or color when it comes to paint? Is it gray, or grey? 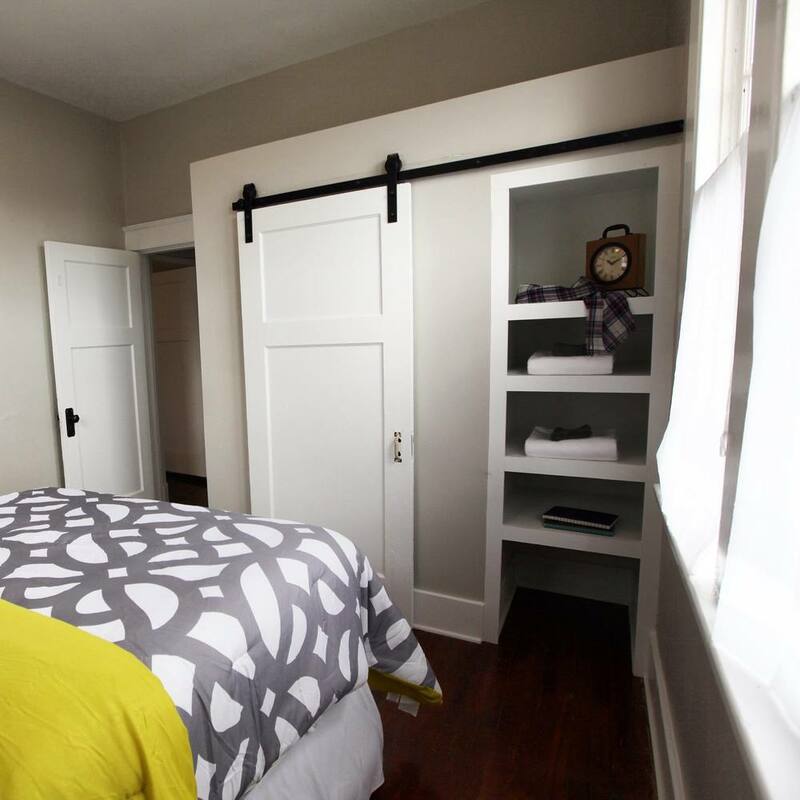 One thing is for sure, gray is such a versatile color, it can work in pretty much any space. There are cool grays, warm grays, grays with an undertone of color. The following are some of my favorites from Sherwin Williams. Keep in mind, this is just the tip of the gray iceberg! Repose Gray SW 7015. This is my go to gray hands down. It's the perfect slightly warm gray. And works almost anywhere. Passive Gray SW 7064. 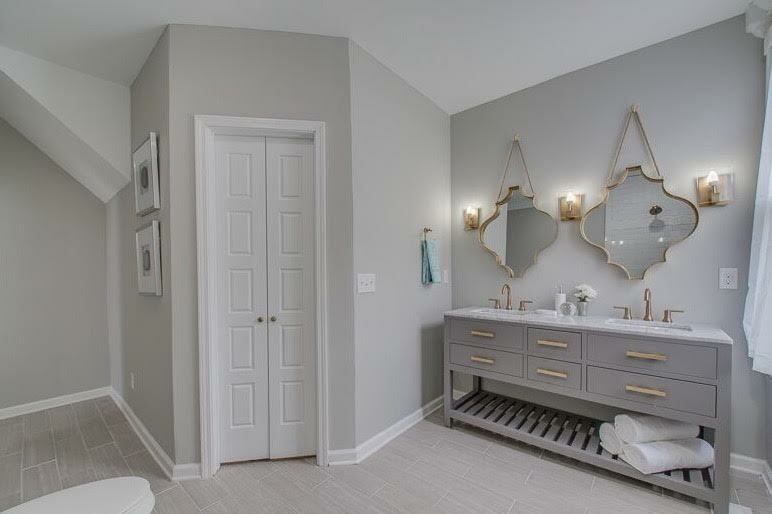 This is a nice cool gray that makes a space feel clean and crisp. It has a slight blueish undertone. Here you can see the same space, painted Passive Gray, in different lights. Color can change so much from one angle to the other. Worldly Gray SW 7043. This is one of my favorite go to "greige" colors. For all of you wondering what on earth is greige, greige is a mix between grey and beige. It works when grey is too grey and beige is too brown. Misty SW 6232. This definitely has a serious blue undertone, but not enough that is screams blue. It is quite subtle and soothing! Agreeable Gray SW 7029. Another great greige. This is the perfect neutral to re-paint your home when you want a blank canvas for yourself, or right before you sell. Lastly Gauntlet Gray SW 7019. This is a great darker gray. It looks lovely on these cabinets and pairs beautifully with marble. Three is the magic number when it comes to styling your interior. Think tall, medium, small. Mix sizes, shapes and textures to add layers of interest. I love to cluster pretty vases together and fill just one with flowers. When you place accent pieces in threes it helps make the design feel complete. Here are a few detail shots from past episodes that highlight the power of three! Lex LeBlanc is an interior designer from NYC now living in the white hot city of Nashville, TN. Her twin sister Alana, is a Realtor in Nashville. When it comes to anything design or real estate related, this duo has got you covered.